The gang-of-four ready to take over the ant world. From left: Philip Ward, Seán Brady, Ted Schultz and Brian Fisher at the IUSSI congress in Sapporo, Japan. 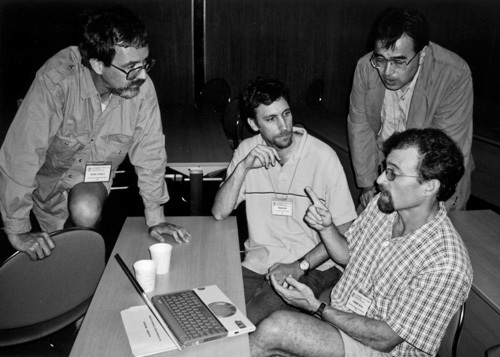 It was at the XIV international meeting of the International Union for the Study of Social Insects in 2002 that the “gang of four” decided to join forces to reconstruct the phylogenetic history of ants using molecular data. Four years later Brady et al. 2006 was published.